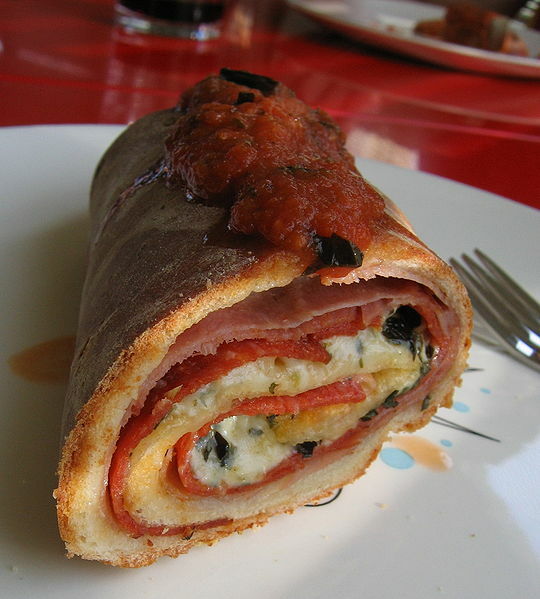 Stromboli is a type of turnover filled with various cheeses, Italian meats or vegetables. The dough is Italian bread dough. Although most strombolis are rolled and tube-shaped, strombolis have also been known to be prepared like a calzone, where the only difference is that a stromboli has the sauce inside of the folded crust, where the calzone is served with dipping sauce on the side. The ingredients for both of these types of pizza are at the discretion of the chef. Stromboli is reported to have originated in 1950 in Essington, Tinicum Township just outside of Philadelphia, at Romano's Italian Restaurant & Pizzeria, by Nazzareno Romano. There, William Schofield supposedly gave it the name, after the movie Stromboli, starring Ingrid Bergman. Other sources claim the stromboli was the brainchild of Mike Aquino, Sr. and that he created it in Spokane, Washington in 1954.